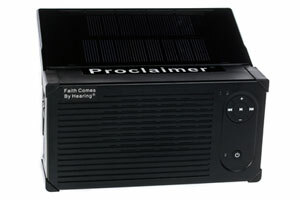 The Proclaimer digital player is preloaded with an Audio Bible recording (usually a New Testament) for the one purpose of proclaiming the Good News of Jesus Christ to the nations. Anniversary Breakfast (2013). The response from the church leaders was overwhelming. The sample unit was provided by Faith Comes by Hearing (FCBH) and contains a microchip with the Scriptures. It is powered by a long-run battery that can be recharged by connecting to electricity via the regular power cord or by solar energy using a wind up mechanism when in remote places. 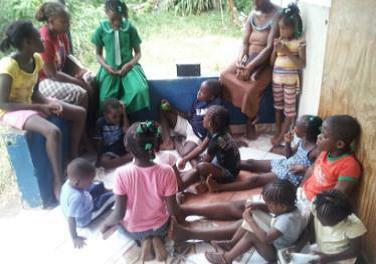 FCBH has offered free units to the Jamaican church and some 20 inner city and rural community ministry leaders have applied. We have ordered 40 units expecting increased interest and a free training workshop with FCBH will be convened in February 2014 for churches committing to have a listening group in their community for persons to hear the entire New Testament in the Jamaican Creole.